Archive from category "Cincinnati Commercial Roofing"
There are more elements to your chimney system than most homeowners realise and each one plays a crucial role in ensuring your chimney system is functioning properly. While for the most part, the primary role of your chimney is to allow smoke from your fireplace to safely leave your home, it’s important to ensure nothing comes back in. Chimney caps are a critical component of your chimney system and are the one element that protects your entire chimney system. With a properly installed and functioning chimney cap in place, you can be sure that your fireplace will function correctly and safely. 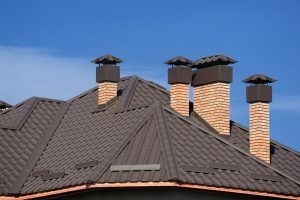 Keep reading to find out exactly what a chimney cap is and why you need one for your chimney system. Chimney caps are located at the very top of your chimney that cover sand protects the opening on top. Chimney caps are installed above the opening of the chimney to allow smoke to pass between the top of the flue and the cap itself. There are many different styles, shapes, finishes and sizes used depending on the aesthetic and exterior painting job on your home but they all serve the same basic functions. A chimney cap is essential in keeping your fireplace running smoothly and safely. Essentially, it acts as a barrier to protect the top of the flue, allowing smoke to exit from your chimney while keeping birds, animals, debris and water out. Chimney caps also help to keep sparks and embers off your roof to prevent potential fire problems. Let’s take a look at four of the main reasons a chimney cap is important. Birds, squirrels, racoons and other animals often seek out chimney systems to protect themselves from predators and from the weather. Having animals camped out in your chimney system can cause blockages, allows an entryway for wildlife into your home and can be unnerving for adults and children alike. However, with a chimney cap installed, you can easily avoid this problem. If you don’t utilize chimney caps, your chimney is highly susceptible to blockages from debris entering the flue. Not only can this cause damage to the flue liner but leaves, twigs, branches and other debris can block up your chimney and prevent proper ventilation. Although the outer elements of your chimney system are built to withstand elements such as rain, hail, ice and snow, your fireplace inside is not. In order to keep moisture out, a chimney cap should be installed or you could end up with expensive repair work to your fireplace that could cost you a lot in handyman bills. When your fireplace is in use, sparks and embers can often travel up the flue. Without a chimney cap to get in their way, they can find their way onto your roofing, into your gutters or even land on your garden and be the cause of a fire. This is something that all homeowners want to avoid and a chimney caps are a simple way to do so. Your chimney is a potential entry point for wildlife, debris and moisture to get into your home. Installing a chimney cap is crucial in keeping your chimney system free of blockages, keeping fire risk at a minimum and ensuring your home and your family are always kept safe.